Lady in Waiting "Are you getting impatient?" people want to know. Somewhat, yes. Though I also am enjoying the amazing roundness of the bump, the peace and quiet of the home, and the freedom to be selfish. Last Saturday I woke up, ate, took a nap, meandered over to the farmer's market, popped in to visit my parents and raid their fridge, met up with Aaron, spent a while chatting in the sun with some friends we happened to run into, then meandered home and took another nap before we headed to a friend's for dinner. Perhaps it'd be nice to have my waist back, to be able to move a little more quickly, and to not need quite so many naps, but there's something to be said for a lazy, pregnant Saturday. Plus, I'm getting scared that I might not get my waist back for a while. That's going to be hard I suspect. What I will get, as soon as The Time Comes, is a son! And I am getting, if not impatient, at least very eager to meet this person of ours. I know he'll be a tiny, wrinkly, floppy-necked, needy, diaper-filling creature. But I also know he's already got the makings of a brilliant, charming, and all-around hilarious, delightful and adorable personality. I have felt stirrings of pure genius from within, I'm quite sure. Phatty Acids If our son wins a Nobel Prize (and I'm telling you, I've felt some very promising kicks), we'll have my friend Jess to thank. She's a bio teacher, and as soon as she heard I was pregnant she called to tell me about the omega-3 fatty acid DHA. Apparently children who were well supplied with this "good fat" scored better on all sorts of tests. In other words, the future braininess of my baby could be influenced by whether or not I spring for the pricey prescription prenatal vitamin that has DHA in it, and the (also pricey) eggs from chickens fed DHA-enhanced feed. Wow! Can I really eat my way to a smart kid? I took the vitamins, I bought the eggs (they're particularly yellow-yolked, which I enjoy) and then Jess brought over a bottle of algae-derived supplements just to be sure I wouldn't burden the earth with a child who shares my inability to do calculus. DIY DHA "Not just any Omega-3: DHA Omega-3. Vital for brain, eye and heart health" it says on the egg carton. Two eggs provide 300 mg of this wondrous stuff. Then there's the 260 mg I get from my prenatal, and another 200 mg from Jess's little orange algae caplets. If you've been reading regularly (or listening to me run my mouth regularly in some other capacity) you'll know that I tend to look for a downside. Could I be getting too much DHA I recently wondered? Do I even know what the letters stand for? I began to feel I should look into matters. From what I've read, it sounds like the preliminary research is full of promise. In addition to being quite healthy for the non-pregnant, non-nursing population, Docosahexaenoic Acid (no wonder there's an acronym!) is thought to support fetal brain and spinal cord development and may decrease the risk of preterm birth. It's credited with improving memory, language comprehension and vision in young children, and at least one study has indicated a possible correlation with good sleeping habits too. Our bodies cannot manufacture DHA, so we need to get it from somewhere, but it is possible to overdo it. For one thing, fatty fish, which are one of the best food sources, should not be over-consumed since they also may contain harmful levels of mercury. Plus, too much DHA may thin the blood. I've decided that the 260 mg in my daily prenatal is a good basic intake. Beyond that, something (perhaps my stomach?) tells me that getting this substance through food is a better way to go. Wild salmon is a great source (here's a recipe). 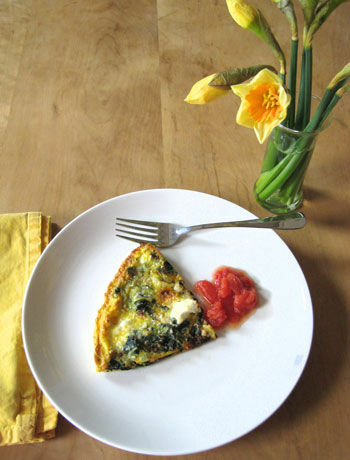 And today, after my farmer's market trip, I'm anticipating spring with a dandelion green and spring onion frittata. I'm looking forward to great things in the coming weeks, and I want to savor every moment.